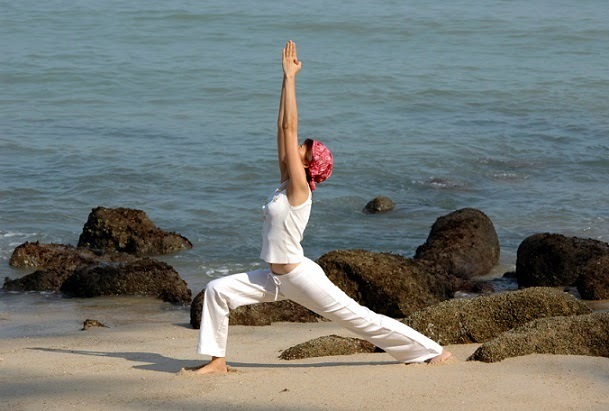 Yoga has become increasingly popular over the years. Where it was once associated in the western world as a new age movement for hippies seeking zen, there is now an appreciation for it's original purpose and benefits. Yoga is good for health, flexibility, spiritual and self control. Once you understand the numerous health benefits of yoga, you will find it easier to relate to why you should incorporate this type of fitness into your life and which style of yoga works best for you. The History of Yoga & What Is It? Yoga is the science of self-control that originated in India around 5000 years ago. Yoga, a Sanskrit word, yuj, means "to link or join together". Today, in the United States, it is primarily known as a physical practice. Yet, it is so much more than just a fitness style which can be further explained to you by professional yoga practitioners. Their study of the history of yoga and practice of the art qualifies these Yogis to teach you how to fully integrate into your life. Yet, your learning the history of yoga helps to understand it more clearly, as well as decide whether this form of fitness and life change is for you. When yoga began over 5000 years ago, Indian society was run from the caste system where everyone was born into their status. Their class decided what they would do, how they would act, etc. Yoga was strongly emphasized at this time as a way for men to understand the value on life and attain a meditative frame of mind. It was deeply rooted spiritually. The men would search for a master that would teach yoga in seclusion from the world to search for and experience enlightenment. Many societal changes like wars, advances in science, creation of religions, etc. have influenced modifications in yoga over the past 5000 years and helped it evolve into what it is to date. Before the 1900's, yoga was primarily confined to religious places like Ashrams and yoga classes didn't exist at that time. The first public yoga class, even as we see it today, was taught in India in 1921. It was made opened to the public with a style similar to what we use now, though ours is not their exact same Hatha yoga. A lot of the structure of the modern Hatha Yoga is also a manifestation of Western education and this may be due to British influence in the India. Interestingly, this became the dominant educational approach in India in the Colonial Period. Hatha yoga has become the more popular because people now recognize it as being a requirement to cure stress caused by society. Yet, there are vast purposes of yoga that benefit more than just this one cause. The purpose of yoga is to become more aware of the body and mind. This is accomplished over time while practicing yoga physically. There is a process of de-conditioning (forgetting what you may have learned before) and doing the newly learned actions with mindful and physical control. It is not a competitive practice, though requires developed skill. You must learn and practice to obtain the full benefits of yoga. In the process, organic life will become your "yoga personality" and take the place of your regular personality. You will evolve and learn new methods of living your life as well as communicating with yourself and those around you. Old habits, a few of which could possibly be unhealthy, may be eliminated. This is all accomplished by increasing awareness of surroundings and true self. Self-control, spirituality, flexibility, weight loss and other health benefits are why you should do yoga. Interested in learning more about yoga?